cost Please contact me for more information on these. Private music lessons in Piano or Guitar within a safe and secure environment. Lessons include all facets of music - practical, theory, scales and technique or if you just want to learn as a hobby. 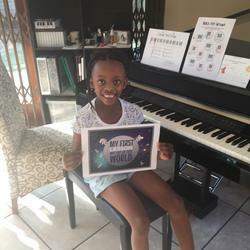 My guarantee for piano beginners - your child will play their first song after their very first lesson! Please refer to my reviews. My son and daughter were begging me for lessons. My first thought was - how do I help them at home to practice because I know nothing of it. However, I was pleasantly surprised as the learning they get during their lessons and the various tools Chane gives them to take home, makes it easy for them to practice. She is also available telephonically which is re-assuring. I recommend Zebra Strokes wholeheartedly. Both girls aged 6 and 8 joined Chane zebra strokes less than 6 months ago. The progress has been amazing. Both girls play confidently by memory more than I ever expected. They look forward to their weekly lessons with Chane. After each lesson there's so much enthusiasm to learn more. Chane is an amazing teacher who really engages with her pupils. Best Piano teacher! I just want to compliment Chane on her lessons for kids. Her lessons are very structured and my kids know what to expect for every lesson. She teaches in a very fun way, but still my kids come home with different songs and homework every week which shows me that they are making progress every week. My kids love their lessons and I am grateful for the passion that she instills for music! WOW! Very happy! All the reviews are true and my little one loves the Zebies Club. Zebra Strokes is awesome. My daughter loves the attention she gets from Chané and is so motivated to learn. Chané is a great teacher with such a great affinity for kids. Would definitely recommend! My girl and I really enjoy our lessons. I admire the different approaches Chané follows for kids and adults. Very appropriate. Chane is so good with my girls. They love coming to their lesson and loves the motivational rewards and fun songs they learn. My two girls wanted to learn the piano for quite a while and I finally enrolled them with Chane. 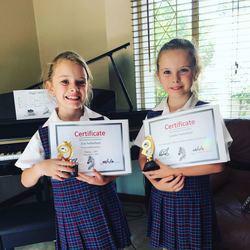 My girls love their fun lessons and music activities and I appreciate the structured, professional and disciplined approach. I am really happy with my decision to enroll them with Zebra Strokes. Chané provides lessons in a really fun way! My son is not very sports orientated, but rather arts and music and loves the time he spends with her and all the attention he gets.